Don’t let Intel stock’s run fool you. Shares of semiconductor king Intel (NASDAQ:INTC) have been on a tear the past year. The stock is up over 50% in the last 12 months, as of this writing, leaving most of its smaller peers in the dust. Meanwhile, shares of mobile connectivity chipmaker Skyworks Solutions (NASDAQ:SWKS) have been flat over the same time period. While it may be tempting to chase the hot hand, the smaller of these two companies is the one with greater upside. Intel's business is near synonymous with the personal computing industry. The company rode the coattails of the PC market for decades and became the largest chip maker there is. Times change, though, and the world began to move to a more mobile form of computing, and the PC business has slowed to low single-digit growth rate at best in recent years. Though half of Intel's revenue still comes from PCs, the company has also been able to leverage its leadership position into new markets. The other half of sales come from the "data-centric" segment, which includes data center and Internet of Things solutions. Taken as a whole, the segment grew 25% year over year in the first quarter of 2018, and total revenue increased 13%. Much like Intel, Skyworks got a big helping hand from another technology movement: mobile connectivity. As a result of its key supplier status to names like Apple, Skyworks quickly worked itself into a crucial role in providing connectivity chips for smartphones and tablets. Like the PC, though, those industries have also matured and slowed down. Skyworks has nevertheless found new applications for its chips in other connected things like cars, smart home devices, and industrial equipment. Total sales rose 7% year over year in the quarter ended March 2018. While Skyworks has experienced a bit of a slowdown as of late, the industries it serves have a bright future. Personal computing, on the other hand, is a drag on Intel. Mobile is quickly surpassing PC in importance and represents the bigger opportunity, as evidenced by Skyworks' sales performance over the past decade. Intel and Skyworks revenue by year. Data source: YCharts. That trend is expected to continue. According to technology research firm Gartner, the number of connected devices in operation worldwide is expected to double in the next few years to over 20 billion. That should keep the wind blowing at Skyworks' back, propelling revenue and profit higher. That's not to say Intel won't benefit, too. When a company is the size of Intel (currently with an enterprise value of $259 billion), it inevitably has a hand in multiple endeavors. Overall, though, sales are expected to grow modestly, and earnings have been getting a big boost from share repurchases. (There were 1.9% fewer shares outstanding during the last quarter compared to a year prior.) Skyworks shareholders got a boost from stock buybacks as well, with 1.7% of shares outstanding being taken off the market in the last year. However, financial engineering aside, the expectation is that Skyworks' top-line growth will reaccelerate in the quarters ahead and make a big impact on the bottom line. There is beauty in simplicity, and though Intel stock has been by far the better performer in the last year, there are a lot of moving parts that could affect business results. 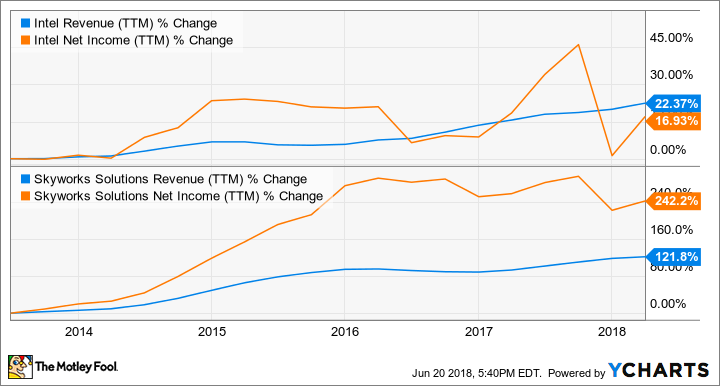 Skyworks is a much smaller company with an enterprise value of only $16 billion and has operations focused on mobile connectivity. With technology continuing to go that route, its stock should be the better play in the years ahead.